With soft apple pieces in every bite, it is hard to stop at just one of these Apple Waffles. Sweetened only with fruit they are perfect for serving as a snack, at breakfast or popping in the lunchbox. Heat a non-stick frying pan over a medium heat and add 2 tbsp of butter. Allow to melt and add the chopped apple and cinnamon. Reduce the heat, and sauté until soft (around 3 mins). Remove from the heat. Place the sultanas in a small bowl and soak with boiling water. In a large mixing bowl combine the dry ingredients. In a separate bowl mix together the wet ingredients. Add the wet ingredient to the dry and stir. Be careful not to over mix, some lumps are fine. Drain the sultanas and add to the waffle batter along with the sautéed apples. Stir until just combined. 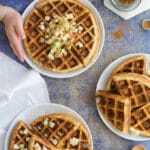 Spray or lightly brush your waffle machine with oil on both sides. Scoop 1/3 of the mixture into the centre of your waffle machine. Close and cook until the light indicates it is ready (this may vary depending on brand of waffle machine, cook to manufacturer instructions). Transfer to a cooling rack and repeat until mixture is finished.